The story of M’Hudi is that of a Setswana woman who was displaced by the invasion of the Zulu. Living in the bush, she met a man also separated from his people who she saved from the jaws of a lion and then settled with. Taken from the original word “Mohudi” meaning “Harvester”, it’s a story about forgiveness, courage, friendship, and determination to survive that was written in 1920’s. 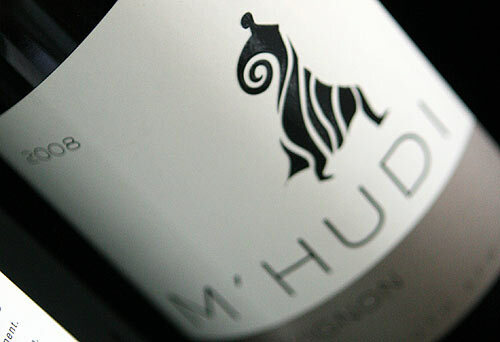 The M’Hudi winery has a 14,000 case production per year that is sourced from 21 producing hectares of vineyards. While the primary winemaker to date has been Jeff Grier of Villiera Cellars, they are transitioning to the family handling all the wine production, specifically the older brother, Diale Rangaka who has attended the viticulture academy. At this point, it should also be noted that the family who owns M’Hudi are black South Africans and the first family in the country to do so given that all others are white South African owned, with some unfortunate “bad apples” in the mix. But, lying in the area of Bottlelary Hills of Stellenbosch, they have set about producing their wines and bucking this 350 year-old trend. I have to admit that I was unaware of this distinction and when tasting from among the hundreds of Stellenbosch wineries, chose M’Hudi solely on it being nearly the same as my first initial and last name “mhudin”. Who would have thought I would come upon this story purely by that chance? But, on to the wines.